The Remains of an Epson and Reply Corp PC. Whilst I was on holiday at my parents place I did some photography of old hardware I have. I got out the remains of two currently dead PCs, one an Epson PC AX2 and another, a Reply Corp machine. The first machine was made by a company called Reply Corporation (or Reply Corp for short). Interestingly there is absolutely no information available about the company online, almost as if they had never existed. I did manage to find a few machine reviews within the Google books archive of some PC magazines, but other than that nothing really. There was a segment or two featuring them in the Computer Chronicles (an old American TV Show) but I couldn’t find the particular episode. As far as I could tell Reply Corp started out making PC cards for Macintosh machines. These cards brought PC compatibility in a limited degree to Apple machines so that popular software like Lotus 1-2-3 could be used. It seems that somewhere along the line they started making their own clone machines. They were one of the few third party manufacturers to actually purchase the rights and make MCA (mirco-channel architecture) machines. With MCA failing in the market and PC cards being a very niche product, it’s no surprise that Reply Corp disappeared into obscurity. The machine I have is one of the MCA machines, a model 16 with a 486dx 33Mhz chip, note I’ve stripped out the drives and power supply for use else where. Unlike the IBM MCA machines it doesn’t use a fancy modular and tool-less design, instead opting for more standard mounts for the drives and power supply. This made it easier to replace these components without having to buy proprietary ones like those in the relevant IBM machines. Note the CPU is mounted on a module, we’ll take a closer look. Here’s the CPU module up close. At the time PCs generally had either the CPU soldered onto the board, a standard chip socket (DIP/PLCC for the 286) or an old style LIF (low insertion force) for the 386 and earlier 486 machines. These solutions made upgrading a CPU a difficult task, if not impossible. Reply addressed this by using an easily replaced module, something quite unique amongst IBM PC compatibles of the time. This particular module has a 486dx chip rated for 33Mhz, but when it was running the BIOS reported it as a 486SX @ 25 Mhz, so I wonder if this is the original chip. The oscillator on the board is 50Mhz, which would indicate the module was made to run at 25Mhz (the oscillator frequency is usually halved). The motherboard has a Chips and Technologies chip set along with a relatively thick layer of dust. It has on-board VGA graphics and unusually 2 25-pin serial ports and 2 parallel ports. Chips was never known for high performance, but they are usually quite compatible. They may have been one of the few to make a third party MCA chipset. We got the machine originally as a replacement for our aging 386sx, it served us well for playing MS-DOS games for quite a few years. I believe it may have been ex-government as it had a SCSI hard disk and controller as well as a token ring network card. It has an unfortunate annoyance of requiring a setup boot disk to configure the BIOS settings much like IBM machines did. Unfortunately there doesn’t appear any way to get a disk now. The board has since failed, giving a BIOS beep code indicating a parity error. I’ve tried resuscitating it to no avail. The second machine is an Epson PC AX2, which is essentially a pretty bog standard clone 286 running at 12 Mhz. My uncle gave it to my Dad for some reason, and it was basically dead upon arrival as it was already missing its power supply. The insides of this machine are looking bare among our reading material on the table. I had stripped out the I/O cards it had some time ago. It had a MFM hard disk controller, an EGA card and a floppy controller. It doesn’t have much integration on the board despite the number of chips, basically only a keyboard port is provided. It has a AMD made 286 running at 12Mhz. You may notice it has the Intel copyright on it, this is because AMD was a second source manufacturer of the 286 (and other earlier processors) to ensure availability of the parts. This would be the last processor that AMD would second source for Intel, as they stopped co-operating before the release of the 386. This machine has a module as well, even mounted and connected in a similar fashion. The difference is this module appears to be for the main memory and ROM for the machine. It’s an odd design choice, but perhaps the ROM and memory design were shared across models and designs of Epson machines. This would not be an upgradable module, memory upgrades often came in expansion cards for the ISA bus. These three chips seem to confirm what I had seen online, that this model was originally released sometime in 1986. What’s interesting is the date code for these chips indicates the 23rd week of 1989, which would have made this machine quite obsolete at the time of manufacture. I’m surprised they didn’t upgrade the design to 16 or 20Mhz as they were common speeds for the 286. The three chips are almost certainly the base mother board components such as interrupt, timer and DMA controllers. Here is the reason I can’t run this machine currently. It has a power connector with an unknown pin-out, and with the original power supply missing I don’t have much chance unless there is some documentation around. This is unfortunately common for earlier PCs as standards hadn’t been formed yet. I’ve been keeping both these old machines in the hope that one day I might find or work out the information needed to get them to work again. They’ve unfortunately languished under a table in my room at my parents place collecting dust, I hope they’ve at least been somewhat interesting to look at today, as they aren’t much use as they are. It’s been about a month since I’ve been able to write a post, so apologies for the un-announced hiatus. I’ve been slightly burned out with work and kids keeping me extremely busy, but I’ve taken a nice holiday to my parents place in the bush to recharge the batteries. So to kick things back off I’m looking at a small game called Bubble Pop made by Software of Sweden back in 1997, quite a while after MS-DOS games were main stream. It’s quite obviously inspired by Bubble Bobble, and shares much in common with the arcade game. Today I played the shareware game which only includes the first 10 of the 100 levels. There is a little bit of history in the readme about the company, they were originally a demo group on the Amiga starting back in 1986. I have never really been into the demo scene, so I haven’t heard of them before, but being a part of that explains some of the art style and technical prowess in the game. VGA is the only graphics mode as you’d expect, and the art is generally very colourful and nicely drawn. The item pickups look very much like those you’d find in Bubble Bobble, but the other sprites are quite different. Speed wise it performs quite well and everything animates quite smoothly. Whilst the readme recommends a 486 @ 66Mhz, it could probably run acceptably on a slower machine, although I suspect a 386sx would be too slow. The only sound card support available is for the Sound Blaster and Adlib cards. There is some pretty decent music and sound effects, unsurprisingly much like you’d find in demos from the PC or Amiga. It doesn’t perform as well as the graphics do, the music and audio pauses and stutters during transition effects and loading. Game-play wise it is similar in design to Bubble Bobble with a few differences. Your default attack is essentially a melee attack that traps the enemy in a purple bubble. You can’t pop the bubbles, instead you have to push them and attack to make them fly around and eventually burst. The purple bubbles can hurt other enemies as they fly around the screen, causing a cascade potentially knocking off many bad guys in one go. This can be a problem if you want to collect all the score items, but have killed all the enemies before getting a chance to. The bad guys themselves are fairly simple with only a few types available in the shareware episode. At the end of the shareware episode is a mini-boss, which is essentially just a larger normal enemy. You have to use the smaller enemies to kill it by bouncing them off the boss in purple bubble form. Some other elements are almost identical to Bubble Bobble, such as a dangerous enemy appearing after not completing the level in time, and the food themed scoring items. The few enemies I’ve seen are similar in behaviour with a few exceptions, and whilst the levels are different, they have very similar basic designs. The shareware version of Bubble Pop is extremely limited with only a very few levels and enemies compared to the full game. So I’m sure the full game has much more content, but as it is Bubble Pop isn’t as fun as the game that inspired it, and with the price of about $24 AUD I doubt many people would have forked out for it. A few weeks ago I salvaged some equipment from a room clean-out, see the first post to see all the ISA bus parts and loose chips. Today we’ll be looking at the PCI cards, which are unsurprisingly all Adaptec parts. They are different from the older parts from last time in a few ways, firstly their construction is radically different because they use mostly surface mount components. They have fewer component counts with much much more integration on ASIC chips instead of off-the-shelf parts. Finally, Adaptec typically made some of the better SCSI cards with more processing done on the card rather than the host machine, this meant more CPU for applications and higher data through-put. The first card here is an AHA-3940uw. This card was available for UltraSPARC systems as well as PCs. It doesn’t have RAID capabilities, but will do DMA transfers with-out CPU intervention to save processing on the host. It requires the host system meet PCI specification 2.1 and that PCI-to-PCI bridges work on the host chip-set. I believe that this is because the middle chip is such a bridge and the chips on each side manage one channel each. The bridge chip appears to be manufactured by DEC (Digital Equipment Corporation also known as Digital for short) which is interesting as they weren’t really in the expansion card market. This card appears to be from the late 90’s, it even still has MS-DOS support even though that wasn’t relevant at the time. Here we have an ASC-29160 a 64bit PCI-X card from around 2000. PCI-X allowed for faster transfers to and from the card, which could have made quite a difference. Cards such as these could have something like 15-30 devices connected at maximum, although many fewer in practice (due to physical limitations of having that many HDDs). Many hard drives could easily generate more data than the standard PCI bus could handle (133MB/s) thus making the bus a bottle neck in the data flow. The PCI-X standard can achieve twice the speed of PCI if running at the standard 33Mhz, but can get much faster with higher clock speeds that were offered. The most common speeds you’ll find are 33Mhz, 66Mhz and 133Mhz, but higher speeds were developed although not widely used. This is a AHA-3940AUW which is essentially a redesign of the first card. It offers the same number of ports (at the same speed) plus a legacy SCSI connector all from the one integrated chip. It seems from the date codes that it was manufactured about a year later, so it’s probably just an incremental improvement (perhaps just for cost). Adaptec also made lower end cards, here’s an example of one, an AVA-2906. It was made roughly mid 1999, but only supports the older SCSI standards at much lower speeds (10MB/s). It could have been used in the consumer market for scanners and early CD burners, both devices with lower bandwidth requirements. Whilst not being any faster than the ISA cards from last time, it would most certainly have cost significantly less. Lastly here is a AHA 2940UW, which is basically just a scaled down version of the 3940 cards shown earlier. Whilst it’s not remarkable, it is a handy card as it supports most of the SCSI standards without being complicated or expensive. That’s all the PCI SCSI cards that were saved, I did note a few things about them collectively as a group. Firstly most of these cards appear to be similar in both age and features, and they are all Adaptec cards. This was a common practice for a few reasons, mostly ease of replacement (and fewer spares required) and less hassle when commissioning new equipment. It can save lots of time. I’ve used Adaptec cards frequently specifically for their RAID feature, none of the cards here have this feature. The original machines mustn’t have needed either the additional space, speed or redundancy that RAID affords, as most of the cards featured also came in a version that supported RAID, but would have been more expensive. Today we’re looking at the sequel to Xerix, a game written by Brendan Reville as a 15 year old. It was simple in many aspects but technically very impressive. Two years later in 1994 he released a sequel, simply named Xerix 2, which is essentially a more refined and polished version of the first game. It was originally released as shareware at the time under the name Twilight Software, but was still a one-man show consisting of Brendan himself. The graphics engine appears to have had little changed, but it was already fairly impressive. It supports colour VGA and has dropped the monochrome mode, which was probably a wise move as few would have had need for it. The largest difference is in the graphics itself, the artwork appears more refined and there are substantially different themes for most of the levels. The balls of steel enemies are back, but there are other enemies and it’s much clearer where turrets are located. There are 12 levels this time, so there’s much more artistic variety, but some aspects still lack the extra detail you’d find in a commercial game. I still think it’s quite good graphically. Sound wise a very wide variety of hardware is supported, although for the purposes of running it now-a-days only the sound blaster support really matters. It sounds like he’s used some kind of wave-table style music, which technically sounds great but the music itself is fairly simple and quite repetitive. I don’t think it’s bad, you may just find it better with the music off. I left the music on myself as i didn’t mind it. Xerix 2 plays much like the original in many ways, but with significant differences. Firstly the enemies aren’t flying randomly, but are following set patterns of flight around the screen. They mostly move diagonally around. There are a number of different types of enemies, however they all behave the same, the only difference being how hard they are to kill. There are stationary turrets like in the first game, but they only shoot one projectile in your general direction. They can be destroyed, but their shots often block yours and will do significant damage if you are hit. The turret will only have one shot on screen at a time so you can dodge the initial shot then destroy the turret. Like other shooters there are power-ups for your weapons and shield restoration items. The power-ups come out of dead enemies at specific points in the levels and are different for each one. The main problem is they don’t turn up very often. Luckily you keep the upgrades upon death, so you don’t have to worry about completing a level without the right weapon, but you lose all of them (except the first one you get) at the start of each level. The upgraded weapons work fairly well given the right positioning. It’s not with-out problems, for a start your ship moves quite slowly making it difficult to do any effective dodging and shooting. There is also no immunity period after being hit, you can get destroyed and lose multiple lives extremely quickly. It is still largely a nice improvement over the original game. Gemini from Ancient DOS Games did a video on this particular game quite some time ago, and I didn’t completely agree with everything he said. The main thing I am in disagreement about was the comparison of this game versus something like Doom or other shareware he mentioned. The shareware market was a unique situation, companies and individuals of all kinds released software this way. So big companies and smaller shareware authors (often individuals) shared the same space. Whilst it’s true it doesn’t compare favorably to shareware such as Doom, it’s not really a fair comparison to make as Doom and other high quality shareware was made with essentially the same resources as fully commercial games. That is a small-large team of people did the work. It would be fairer to compare it to other shareware games also made by an individual. Compared to other one-man shareware authors it is kinda middle of the road. There are plenty of better and worse games within this category. Another one of the beefs Gemini had was with the pricing, and on this I can see his point. I think the author could have chosen a better (cheaper) price point. It’s a bit of a moot point now, as the game was made freeware by the author some time ago. I actually was pleasantly surprised as I enjoyed the game despite it’s clear short-comings. I had watched the relevant ADG episode and expected something much worse. Is it worth a play now? Well I think that depends on whether you’re a fan of shmups. I’d say that die-hard shmup fans (which Gemini is as far as I understand) probably wouldn’t enjoy it as much as other players. The lack of speed for your ship may be a source of annoyance, but there is some fun to be had if you can look past that. Recently at work we’ve had a little clean out of a storage space that had some old and unused computer parts among other items no longer being used. It turns out some quite interesting and useful old parts were in storage there, some of which I’ve been allowed to keep. This is of course on the condition that any data on any device or media is securely erased. Most of the computer parts are Adaptec SCSI cards of various vintage, but there are also a few other ISA cards, loose chips, a couple of hard drives, and an amount of tape media that will be useful for some of my tape drives. So too much to show in one post, this time I’ll be looking at the loose chips and ISA cards. First up we have these spare chips. The four at the top are SRAM chips, although it has been difficult to determine the exact size and pin-out, I think they are 256 x 4bits. The data sheet is proving elusive for these. The bottom three chips are EPROMs, the two left most being hitachi HN462732P chips and the right a NEC chip. The middle chip of the three is a OTP (one time programmable) so is basically of no use unless it is blank, but the other two are UV erasable so may prove useful in the future for repairs. 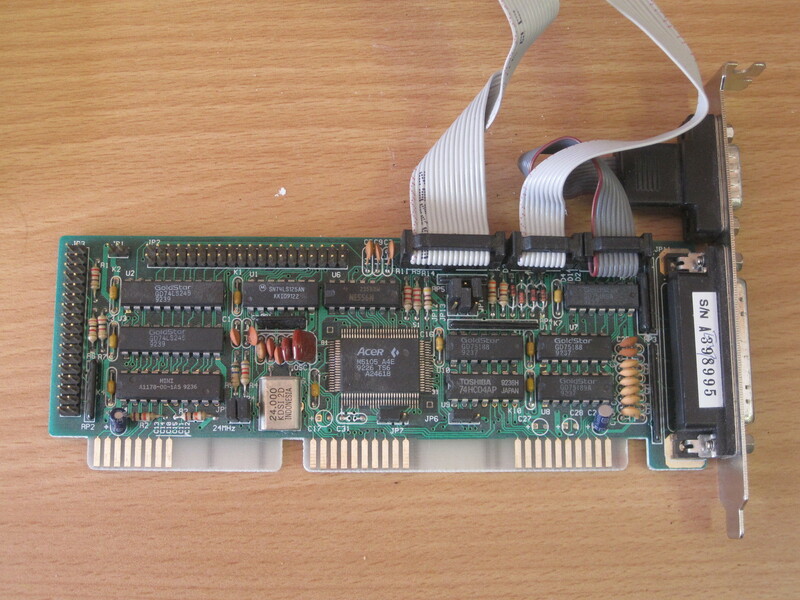 Here is what appears to be an early SCSI card made by Trantor in 1992. There seems to be little information about Trantor around on the internet, but it seems they were bought out by Adaptec at some point, although this doesn’t seem to be documented. If I remember correctly they were known for the tape drives they made. This particular card is handy as it will fit an XT class machine and appears to have the chips and ROM necessary for booting of the SCSI disk. There are even still some MS-DOS drivers available for it. The silk screen has the jumper configurations, so I shouldn’t need a manual to use it. Here we have two IO cards, one with an Acer chip-set and the other with one from UMC. These cards would have been exceptionally useful for 286 and 386 machines as they have most of the IO you would need all on one card. They both have two serial ports, a parallel port, a joystick port, floppy drive connector and a hard disk (ATA) connector. Quite the array of ports indeed for one card! The main problem with having one of these today is finding out what the jumper settings on the board are, there isn’t any silk screen to speak of. This is an Adaptec AHA-1542b, made in early 1993 from the date code on the main chip. It supports SCSI-2 and can transfer data at about 10Mb/s connecting up to 7 devices. It’s interesting because it has a floppy connecter as well as the usual SCSI connection. You may notice that it has two ROM chips, one is the usual BIOS extension to allow for operating systems like DOS to access the disks. The other is micro-code for the boards controller. Finally here we have two cards, both Adaptec. One is an AHA-1510A and the other is an AHA-1522A. You may notice that both actually use the same board, just the 1510A has far less components populated. The 1510A is basically a stripped down card with all the extra bells and whistles removed to make it cheaper. The user manual for it says that this cheaper card is “utilizing the CPU’s untapped power to improve system I/O performance.” So I’d say that it doesn’t have DMA support on the cheaper card among other missing features. I had a look on the Adaptec website for all the cards shown today, and surprisingly despite their age downloads and manuals still exist. I can only applaud them for still offering the downloads, I only wish more manufacturers did the same. Next time I’ll show the various PCI and PCI-X cards, and yes they are all Adaptec. Today I’m looking at a Socket 370 board that would have been made roughly in 1999-2000. It was an interesting period as much of the early legacy technology such as the ISA bus was fading out, marking the beginning of the end for complete backwards compatibility. It is also close to the end of configuring major component with jumpers, replaced with auto-detection and software control. Although this particular board still has a few jumpers. It’s a MS-6153VA made by MSI, a manufacturer known for making boards with gaming and over-clocking in mind. It seems they were one of the first to offer over-clocking as a feature quite early in the history of PCs. Surprisingly it was a 286 mainboard, a time when overclocking meant replacing the crystal oscillator. They still cater to the over clocking market with a series of boards dedicated to it. Here’s an overview of my board. It’s remarkable because there are actually two boards with the same model number that differ significantly. This board has a VIA chip-set and is marked MS-6153, but if you search for that online you turn up a board that looks almost identical but has an Intel chip-set instead. The model number used in online references is MS-6153VA for the VIA chip-set. This must have caused some confusion at the time. Here’s something different, 4 LEDs to indicate the current status of the system. If there was a problem they could use these instead (or in addition to) the standard BIOS beep codes. It wasn’t something you’d find commonly, but was extremely useful if you were lucky enough to have a visual indication. Some manufacturers took it further, using two 7 segment displays instead. Like a previous Socket 7 board, this has a thermister mounted in the middle of the CPU socket. They’ve used a different package, a small flex with the component built in. I’m guessing they did this in an attempt to get a better reading closer to the CPU. The chip-set is a VIA Apollo Pro 133A, which would have been quite decent for the time. Around the main chips are some of the reference silk-screen, which are quite handy, but are unfortunately quite distant from the jumpers they are a reference for! This may have been necessary due to the layout of the board, and I’m sure the manual would tell you where to find them, but it is annoying as it seems to effect every single silk-screen reference. Speaking of the manual, I was able to find a download on the MSI website, however it was in the form of a EXE file! Since I’m using my Mac book I wasn’t able to easily open it, bad form MSI. Next to the floppy connector is a connector that seldom got use in desktop machines. It’s an infrared header! Wireless technology had yet to really evolve into what it is today, and a cheap and simple technology commonly used was infrared, still used today in TV remote controls. It wasn’t commonly used mostly because IR (as it’s commonly called) relies on direct line of sight, and can easily be interrupted. These IR devices were usually treated as a serial port, so software like hyperterm was usable with them. In use they usually proved to be slower and less reliable than just using a cable. From a technicians view-point it’s also fairly decent, it supported Intel and Cyrix chips up to 800Mhz which was decent for the time. It could also support the large 256Mb SDRAM sticks running at 133Mhz, allowing for a maximum of 768MB of RAM. There are also some rudimentary overclocking features on the board. The main annoyance is with the silk screen reference being so distant from the jumpers, and not having very descriptive names. Still, you could set this up without the manual. Feature wise this board would have satisfied most end users, although audio and ethernet isn’t integrated. At that point in time integration hadn’t become the norm for those. Luckily there are plenty of PCI and ISA slots so it wouldn’t have been much of an issue. With the right CPU, RAM and GPU it probably would have even made a decent gaming rig for the time. sparcie on The Remains of an Epson and Reply Corp PC. justinwl on The Remains of an Epson and Reply Corp PC.